The anatomy of the human tooth can be broken up into 3 distinct sections: the Crown, the Neck and the Root. 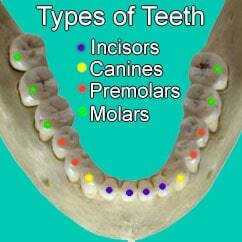 Although there are different types of teeth, all 32 permanent teeth in the healthy human adult have these 3 parts. The anatomical crown is the top portion of the tooth which is visible. 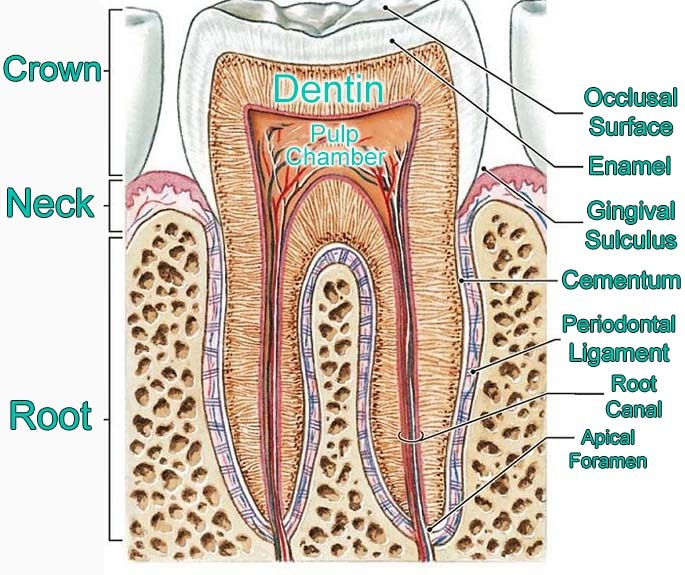 In the anatomy of a healthy tooth, the crown is covered by the enamel layer. Enamel. The strongest, outermost layer of the tooth’s crown. This calcified tissue comprises the hardest substance in the human body & provides the first layer of protection against tooth decay. Dentin. The yellowish, underlying tissue layer beneath the enamel or cementum layer of the tooth. As enamel breaks down over time from aging or tooth decay, the dentin layer becomes the layer of the crown which is exposed, creating a more yellowish tint to the color of the tooth. The neck (dental cervix) is the portion of the tooth that rests in between the crown and the root of the tooth. It connects the outermost layer of the crown (enamel) from the outermost layer of the root (cementum) at the dentinoenamel junction. Gums (gingiva). Soft tissues that support & hold the root of the tooth in place. Gingival tissues anchor the root and neck of the tooth to the alveolar bone (underlying bone in the jaw that supports tooth structure & development) through the periodontal ligament. Pulp Chamber. This chamber houses lies in the innermost portion of the tooth’s neck, below the dentin layer, and houses the pulp of tooth. Pulp. Nerve tissue and blood vessels that run through the pulp chamber of the tooth. Critical in supplying oxygen to & giving the sensation of touch to tissues of the tooth. Cementum. Hard tissue that covers the root of the tooth & connects it to the gums. Compared to enamel, this layer is much more thin & delicate, but is still nearly as hard as bones. Root Canal. The central passage that runs vertically along the tooth root. This canal houses the nerves and blood vessels of the tooth & connects gums to the pulp chamber. Periodontal Ligament. Transitional layer that both connects & separates the cementum layer from the alveolar bones of the upper and lower jaw. Similarly to the pulp, this section of the tooth also contains blood vessels & nerves. There are roughly 32 teeth in the normal anatomy of the adult human mouth, with 16 on both the top & bottom jaw. Among these 32 teeth, there are 5 types that each serve different purposes and are located in different areas of the mouth. Molars (8 in mouth). Rear teeth that are mostly flat & best used for the mechanical grinding of food. Typically erupt from gums at 6-8 years of age. Wisdom Teeth (4 in mouth). Also known as the 3rd molars, these troublesome chompers are located in the very back of the mouth & are often surgically extracted in the teen years to prevent complications from developing as a result of their presence.